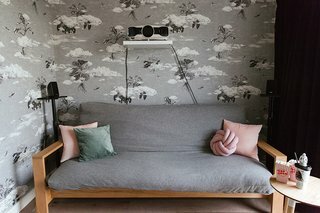 Wallpaper designer Sian Zeng invites us inside her dreamy apartment in Greenwich, London, and shares secrets about her design process. 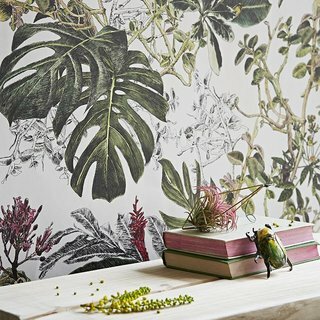 It's no wonder the enchanting, hand drawn, illustrated wallpapers of Sian Zeng have caught the attention of publications such as The Sunday Times and Elle Decoration. Her designs have been long adored by creatives all around the world. Inspired by dream-like, fairytale narratives, Zeng's beautiful work offers consumers interesting ways to bring both art and storytelling into their homes. Recently, we spoke to Zeng to find out more about her design process, as well as how she has used her designs to decorate her 770-square-foot abode. Keep scrolling for a breathtaking peek inside. Born in China, Sian Zeng moved to Hungary with her parents when she was seven. She later relocated to London, where she studied textile design at Central Saint Martins, and now lives with her husband. Zeng finds inspiration in anything that tells a story—ballet performances, movies, photography, etc.—and particularly likes the works of British photographer Tim Walker. "I gravitate toward nature in my designs, as I think it helps bring a sense of calm to a space. When designing a wallpaper, I like to imagine it's a backdrop to a theater set," says Zeng, who explains that the sheer size and scale of wallpaper impacts how she approaches its design. 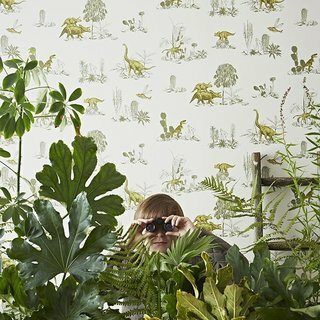 Here is a look at her Dino Yellow Green wallpaper. When preparing her designs, Zeng will often create a pattern where the repetition isn't too obvious, as she believes this makes the look more immersive. "When you do a sketch or watercolor for a frame, you only need to consider the size of your paper, and perhaps the style of the room where it will hang. 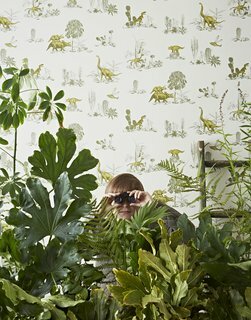 But when painting a wallpaper mural design, you need to consider how it’s going to repeat in a typical room," she notes. "This means thinking about how big the individual elements will have to be in order for it to look striking—both up close and from far away." Because this was their first home purchase, Zeng admits she was a little obsessive about making it perfect. She used inspiration boards and mock-ups to help her visual each room. 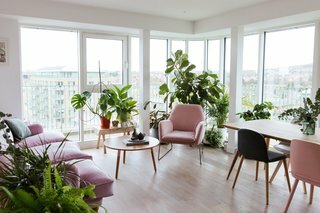 When Zeng and her husband, Sebastian, first saw the flat that was to be their new home, they fell in love with its huge terrace, and decided to turn it into their own urban jungle by building trellises and adding plants. 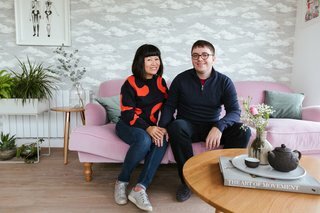 "Prior to moving in, we didn’t own a lot of furniture, so we had to order most of it in advance before even stepping foot into our new home," Zeng states. "Creating mock-ups not only helped me plan our purchases, but also allowed me to imagine what the space would look like remotely." Zeng has beautifully woven modern and classic elements throughout her home's decor. The Sofa Workshop is upholstered with Andrew Martin fabric. The armchair and coffee table are from Made. 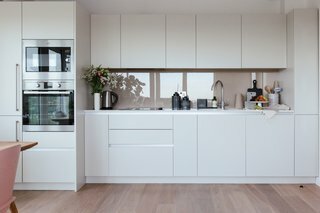 "We envisioned a space that was minimal, but not at all sterile. A place that was full of design, yet still cozy. A home where we were able to relax with our friends on the weekends." An up-close look at the dining table from Maisons du Monde, a pink dining chair from Habitat, and a black dining chair from Muuto. "Above all—taking inspiration from our huge terrace—we wanted to bring nature indoors, and find a way to have an outside-meets-inside feel." 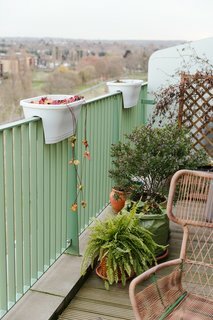 Above, the chair is from Made, and the flower pots are from Habitat. Naturally, Zeng used her own wallpaper to help achieve these goals. She decided on the wallpapers for the different rooms first, then color-coordinated the furniture items to complement her choices. The sink organizer is from Joseph & Joseph, while the white porcelain vase is from Timea Sido. "Before we moved in, I collected fabric cuttings in my notebook. It was a combination of my wallpaper samples and any inspirational images I found online. I would then divide these into sections of the apartment, based on color and mood. This process helped me conjure an overall feel for the apartment, and determine the color palettes of each room." For the living room, Zeng has used Seasons Winter Snowdrift. She opted for this design in the living room because she wanted a minimal pattern that would complement whatever furniture or plants she brought in. She was looking for a pattern that was easy on the eye, and one that would still allow the space to breathe. For the bedroom, she has used Seasons Summer Tropical Bloom, which is one of Zeng’s favorite designs. 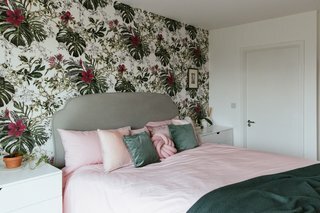 She knew she wanted a busy, dense floral pattern behind the bed to create the feeling of falling asleep in a jungle. The walls of the cinema room/guest bedroom are covered with Seasons Autumn Cloud Forest. Because it’s a cinema room, Zeng and her husband knew they wanted a dark colored wallpaper to help minimize the light reflection from the projector. "We immediately thought of our Cloud Forest design. 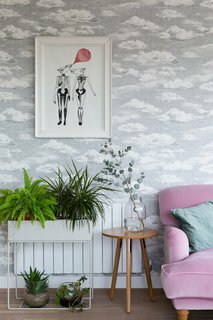 Full of drama, the surreal composition of plants floating between the clouds seemed like the perfect fit for a cinema room," she says. 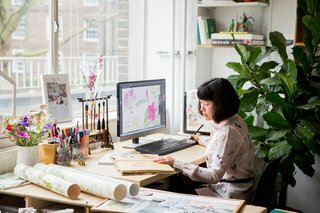 To learn more about Sian Zeng—or to shop her mesmerizing wallpaper collection—check out her website.